One of the Commission’s most important tasks is to gather the opinions of the public in regards to a potential American Museum of Women’s History. In order to do that we here at the Congressional Commission on an American Museum of Women’s History have been doing everything from frantically promoting our survey (if you haven’t taken it, why not?! It takes less than five minutes!) to holding informal focus groups, and hosting receptions. 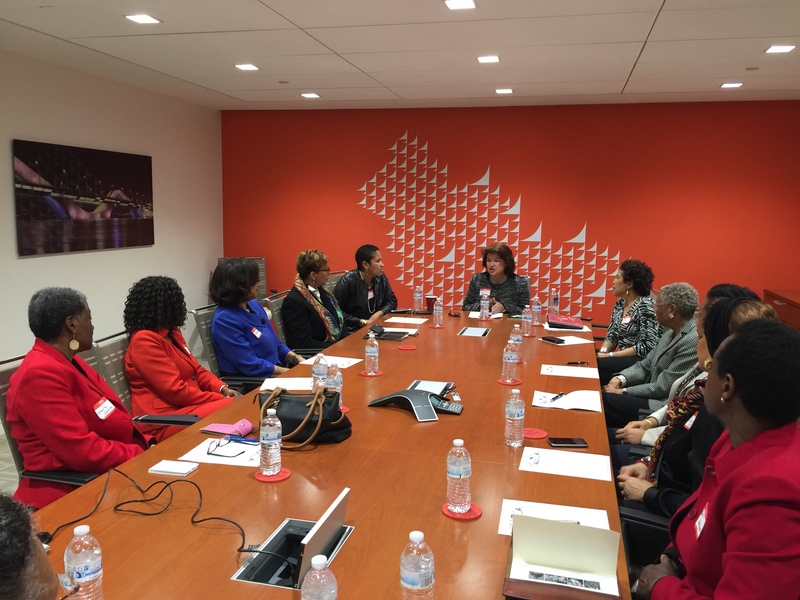 On Monday March 7th the Commission was lucky enough to host a group of esteemed African American women for a luncheon. The women who attended represented a wide spectrum of professions, from lawyers, government officials, to authors and journalists. The luncheon focused on gaining their valuable perspectives on how to make a future women’s history museum as inclusive and thorough as possible. One point was repeated a number of times: in order to tell the whole story of being a woman in America we need to tell the parts of our history that are not very easy to stomach. One woman, quoting Gloria Hull, said: “All the women are white and all the slaves are black.” So often the slave narrative is predominately male centered and the histories of women slaves are often forgotten or ignored. This group of women envisioned an American Museum of Women’s History as one that brings all corners of this country together. Rather than piecing a part our history, these women envision a potential women’s history museum that will seamlessly thread the stories of women together. As one guest of the luncheon stated, “We do not need an African American room, Asian American room or Latina room. We do not need to be separated because we are all part of the story of America’s history.” What it comes down to is that this potential museum will look different. Women are defined by material culture much more than men. One woman brought up the Bata Shoe Museum in Toronto as a perfect example. By simply looking at women’s shoes as time progresses, a guest to a museum can see the change in women’s roles in the home, work place, and the society at large. This was an incredibly informative and far too short luncheon. We here at the Commission look forward to future meetings with these women. Don’t forget to take the survey! ← Previous Previous post: Women Who Inspire Photo Contest!